U.S. President Donald Trump went on the warpath in 2018, starting a bruising trade war that roiled global commerce. The showdown was designed to punish countries -- notably China -- that he said engaged in unfair trade practices, such as stealing American technology, subsidizing industries and underpaying workers. His tariffs, and eye-for-an-eye duties put on U.S. goods by other nations, shook the world economy and caused companies to reconfigure supply chains. The question now is whether China and other countries can defuse the trade war and reach a lasting truce. 1. Why did Trump invite this fight? He routinely points to the large U.S. trade deficit, the difference between imports and exports, as a symbol of a declining manufacturing base and the loss of American might. He aims to reduce the goods-and-services gap, which totaled $566 billion in 2017, by both browbeating and enticing U.S. companies to import less and export more. He’s also threatened to pull the U.S. out of the World Trade Organization, the international body that oversees global trade rules and mediates disputes. 2. What has he done? He first imposed tariffs (which act like a tax on imports) on foreign-made solar panels and washing machines shipped into the U.S. Then he levied duties on steel and aluminum from most countries, including allies Canada, Mexico and the European Union, which retaliated with tariffs on U.S. goods. In stages, Trump slapped duties on $250 billion of goods from China, including furniture and food, and said he’d consider adding goods worth $267 billion to the hit list. All told, Trump imposed or threatened tariffs on virtually all products from China, which struck back with duties on almost all U.S. goods entering the country. Some duties are due to more than double on March 2 if the countries can’t reach a deal. Trump’s also considered tariffs on autos. 3. Will Trump’s strategy work? It depends on who blinks first. After months of on-again-off-again talks, China agreed in principle to increase imports of U.S. agricultural products, along with energy, industrial products and services as part of a path to eliminate its U.S. trade imbalance. That promise might form the basis of a preliminary agreement, though the tariffs may stay in place while the two sides work out differences in the tougher issues of intellectual property, the heavy involvement of the state in China’s economy and mechanisms for the enforcement of any deal. In October, Trump’s threat to abandon the North American Free Trade Agreement prompted Canada and Mexico, the two other signatories of that treaty, to agree to revisions. Tariffs on metals and threatened duties on cars had the EU and Japan also looking to deal. 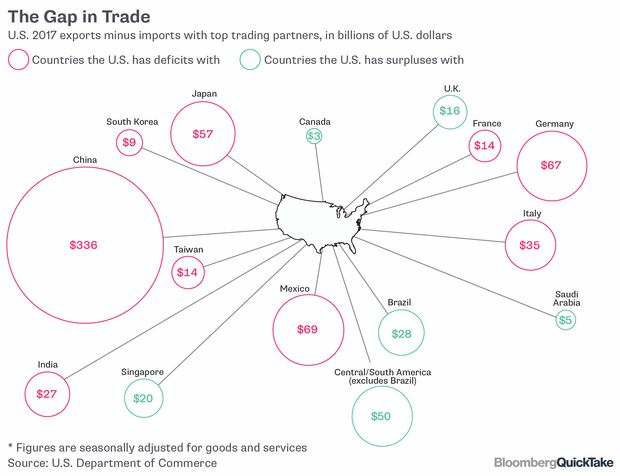 Meanwhile the U.S. trade deficit widened in 2018, partly because the stronger dollar made U.S. exports pricier. 4. What’s the economic effect? That’s still playing out. In the U.S., the trade war has alarmed business leaders, who largely support existing trade deals. Some business groups say Trump’s metal tariffs and retaliatory duties that came in response have hurt U.S. industry, farmers and workers. However, U.S. economic growth remained buoyant, with economists partly crediting Trump’s tax cuts. The International Monetary Fund, cutting its forecast for the world economy for the second time in three months due in part to trade tensions, said in January that global growth would be 3.5 percent in 2019. 5. How about in China? The trade fight came at a time when the Chinese economy was already cooling off, and in 2018 its gross domestic product advanced at the slowest pace in almost three decades. While it’s still growing at more than 6 percent a year -- twice the global rate -- the repercussions of the slowdown reach far beyond its shores to makers of airplanes and handbags, growers of soybeans and operators of tourist attractions. Should Trump apply all threatened tariffs, the fallout could shave 1.5 percentage points off China’s economic growth, Bloomberg Economics estimated. 6. Who are some of the winners? Metals tariffs have helped producers that have American plants, such as ArcelorMittal, U.S. Steel and Nucor. They’re charging higher prices, and some have reopened shuttered sites. Some businesses in Southeast Asian nations expect China’s pain to be their exporting gain, among them Vietnamese furniture producer Phu Tai Corp., which makes home furnishings for Wal-Mart Stores Inc. outlets in the U.S. Some of Apple Inc.’s main suppliers are shifting more output to India and Southeast Asia as the trade tensions threaten to increase costs in global electronics supply chains with longstanding production bases in China. 7. And some of the losers? As Trump intended, Chinese exporters are feeling the squeeze. The products hit by Trump’s initial tariffs could be replaced by other goods, meaning exporters must cut prices to keep buyers, according to a report by research network EconPol Europe. Caterpillar, General Motors, Harley-Davidson and other U.S. manufacturers say tariffs have pushed their costs up as well, hurting profits. Harley-Davidson said it’s shifting some production overseas. U.S. farmers have needed $12 billion in government bailout funds. Apple cut its revenue outlook for the first time in almost two decades, citing weaker demand in China. FedEx Corp. CEO Fred Smith blamed "bad political choices," including Trump’s tariffs, for hurting the company’s profits. 8. Can’t the WTO resolve the dispute? Both the U.S. and China justify their tariffs under domestic laws. That could limit the WTO’s ability to mediate, undermining the rules-based system for global trade. Still, the Geneva-based arbiter of trade disputes is poised to begin an investigation in the U.S. tariffs on $250 billion of Chinese goods.